(Nanowerk News) Nanowires are extremely thin, so their properties can change dramatically when they adsorb even a small amount of a chemical. For this reason, nanowires have been used in sensors to identify viruses, DNA, RNA, proteins and smaller molecules. Now, thanks to work by Guo-Jun Zhang and co-workers at the A*STAR Institute of Microelectronics in Singapore, nanotechnology nanowire sensors could indicate whether a patient is at risk of a heart attack, or myocardial infarction, by detecting a protein called cardiac troponin-T (cTnT) ("Label-Free Electrical Detection of Cardiac Biomarker with Complementary Metal-Oxide Semiconductor-Compatible Silicon Nanowire Sensor Arrays"). 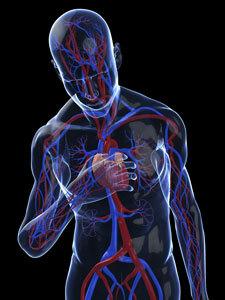 Nanowire sensors could help doctors assess the severity of a heart attack through a simple blood test. Current methods for detecting cTnT require complicated biological assays in which the protein must be labeled. Such methods require well-trained staff, time and resources, and are often not sensitive or fast enough for early diagnosis and treatment of serious conditions. Nanowire sensors, however, present the possibility of label-free, rapid and very sensitive detection of cTnT. Zhang and co-workers made their latest silicon nanowire sensor using optical lithography and oxidation processes—both techniques that could be easily reproduced for mass production. They produced an array chip in which 36 nanowire clusters were arranged in parallel. To make their sensor specific for detecting cTnT, the researchers coated the nanowires with biological compounds including the antibody anti-troponin-T. They tested their device by measuring its electrical conductance in different concentrations of cTnT. The device showed a considerable decrease in electrical conductivity with increased concentrations of cTnT. It was capable of detecting as little as one femtogram (one thousand-million-millionth of a gram) per milliliter in an artificial solution, although the detection limit was slightly higher in real blood serum at 30 femtograms per milliliter. Such sensitivity is possible because just a few charged molecules on the nanowire surface can disrupt the whole charge-carrier distribution in the nanowire.